THERE ARE SOME ARTISTS WHOSE ART MAY BE EXAMINED WITHOUT MUCH STUDY OF THEIR BIO­GRAPHIES, OR REFERENCE TO THEIR LOVED ONES, WHILE WITH OTHERS THEIR WORK IS SO CLOSELY LINKED TO THEIR FAMILIES THAT IT BECOMES ESSENTIAL TO ANY ANALYSIS OF THEIR OEUVRE. MIK­HAIL NESTEROV (1862-1942) IS AMONG THE LATTER: THIS ARTICLE, WHICH INCLUDES MATERIALS, LET­TERS AND PHOTOGRAPHS FROM VARIOUS ARCHIVES, EXAMINES THE CONNECTION BETWEEN THE ARTIST'S FAMILY AND HIS WORK. THESE LETTERS HELP US SEE WHAT IS USUALLY HIDDEN FROM THE VIEWER'S EYES - THE DIFFERENT ROLES THAT AN ARTIST'S FAMILY PLAYS IN HIS LIFE. NESTEROV'S FAMILY MEMBERS OFTEN INSPIRED HIM TO CREATE HIS PAINTINGS, OR SERVED AS "PROTOTYPES" FOR THE SUBJECTS OF HIS LARGE-SCALE WORKS, EVEN FOR THE FRESCOES THAT THE ARTIST CREATED FOR VARIOUS CATHEDRALS. WITHOUT DOUBT, THIS WAS VERY IMPORTANT FOR THE ARTIST; HE WROTE THAT "...IF THERE IS A FACE, THERE IS A PAINTING. IF THERE IS NO [FACE], NO EXPRESSION THAT I SEEK <...> - THERE WILL BE NO PAINTING. LIKE SEROV, IT IS THE HUMAN SOUL THAT I NEEDED FIRST AND FOREMOST." IN MAKING THE ACQUAINTANCE OF NESTEROV'S FAMILY MEMBERS IT IS NOT ONLY HIS LETTERS AND PAINTINGS THAT ARE IMPORTANT, BUT ALSO THE PHOTOGRAPHS THAT HAVE BEEN PRESERVED, WHICH SOMETIMES REFLECT MUCH ON NESTEROV'S CREATIVE PROCESS. THE LEGACY OF THE AR­TIST'S DESCENDANTS, WHOSE LIVES WERE PROFOUNDLY INFLUENCED BY THE PERSONALITY OF THEIR FATHER AND GRANDFATHER, IS ALSO REVEALING. On May 31 (19) 1862 a baby boy was born in Ufa, who would be remembered in the history of Russian art as Mikhail Va-silyevich Nesterov. But back then, Misha was a little misc­hief-maker who was as far from being respectfully called by his name and patronymic as he was from art. The only son of a merchant, he was his father's single hope of preserving the family business. when his parents sent the twelve-year-old Misha to study in a secondary school in Moscow, the only thing that betrayed the boy's future as an artist was the fact that he was quite fond of drawing. Misha's passion for drawing was so strong that it impressed his teachers; it was on their advice that his father Vasily Nesterov (1818-1904) gave the boy permission to leave the school and start, in 1876, his education at the Moscow School of Painting, Sculpture and Architecture. In making this decision, Vasily Nesterov was also making a sac­rifice: he realized that there would be no one to take over the family business, and it was not long before he closed it down. However, he did not just send his son "sailing" out on his own: he warned Mikhail that he would only consider him an artist when Pavel Tretyakov ac­quired one of his paintings for his gallery. 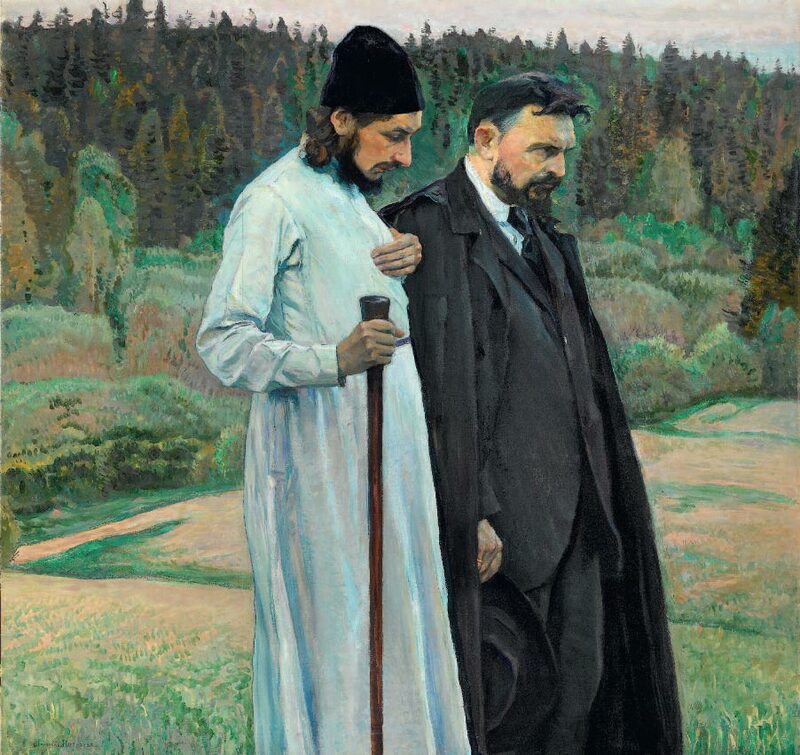 This happened in 1889, when Tretyakov purchased "The Hermit" from Nesterov, and a year later, the gallery acquired "TheVision of the Young Bartholomew". Thus, Mikhail Nesterov had succeeded as an artist in the eyes of his family. 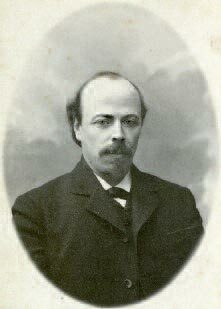 Nesterov remained grateful to his father for the rest of his life -for letting him take "the chosen and beloved path" , and for financing his education. His mother Maria (1823-1894) provided a different kind of support, described by Nesterov in his memoirs: "I have always felt, and still feel that no one ever listened to me or understood my chil­dish, young dreams, my fears, my plans like she did; though uneduca­ted, she was so caring and considerate, she lived entirely for me and through me - my darling mother." Images of Nesterov's parents sur­vive in their portraits, now in the Tretyakov Gallery, which he painted while still an art student in the 1880s. Nesterov's letters to his parents and sister cover the period from the end of the 1880s through the 1890s. 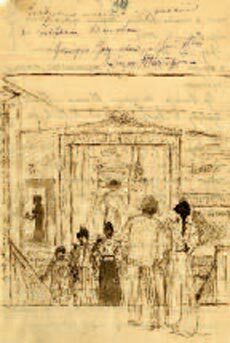 written by a young artist at the beginning of his career, they often read like notes from a diary; the reader is able to get an idea of some events of Nesterov's life, as well as his intentions and plans. He often shared his thoughts with his loved ones and asked them for help and advice. 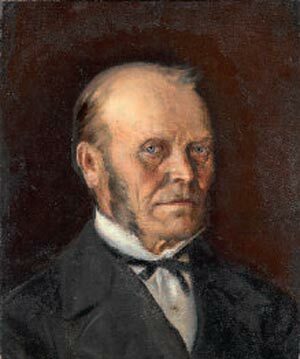 His correspondence reflects one such "family council" - in 1897 the artist wrote to them about his desire to donate his series of paintings dedicated to Sergius of Radonezh to the Tretyakov Gallery; he was asking for their opinion and was prepared to change his mind should they disagree. His sister and his father (in spite of being a merchant) supported Nesterov in his decision to donate art worth a few thousand rubles, and it is thanks to this that the paintings are now housed at the gallery. However, his parents' influence on Nesterov's art was indirect. 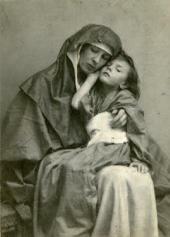 The inspiration he received from his beloved first wife, Maria Marty-novskaya (1862-1886), was much more profound. 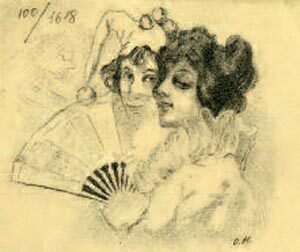 The artist met her in Ufa in the summer of 1883. Later in life he described meeting his fu­ture wife for the first time: "The young lady kept walking; I followed her slowly [on horseback]. we went on like this for a while, and I no­ticed that the stranger had guessed that the rider was not just out and about, but rather had a purpose, so she began watching him through a small hole in her umbrella..." The artist made a drawing de­picting this encounter and called it accordingly "The First Meeting". 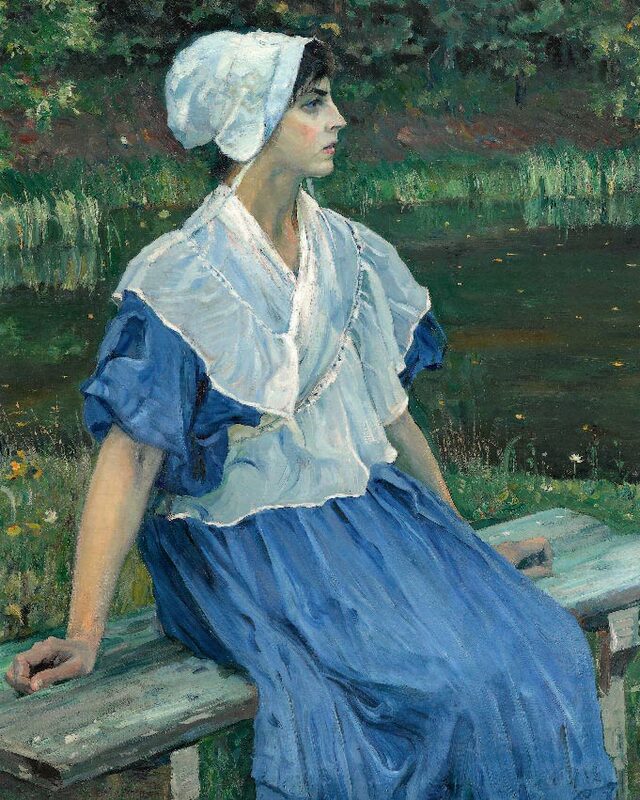 It was the first of a whole series of Maria Martynovskaya's images; more than that, it was in that summer that the female image itself became part of Nesterov's art - before then, it had been absent from his drawings, studies and paintings. 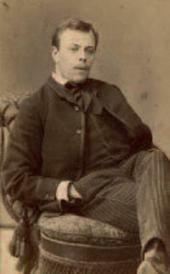 In the autumn following his acquaintance with Maria, Neste­rov returned to Moscow to continue his education. The love-struck couple only saw each other again the following summer; Nesterov worked with renewed tenacity between his visits to Ufa. He finally obtained the long-awaited title of a "free (independent) artist" in 1885 and married Maria in the same year. what was the artist's first wife like? "She was not beautiful in the ordinary, conventional way. 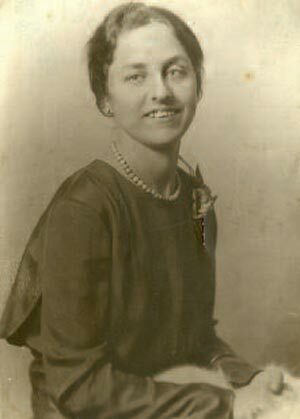 what she did have was elusive charm, innate originality <...> and amazing femininity, which was so attractive not only to my father, but everyone who knew her. [Like] a first spring flower with its delicate scent," wrote Olga , Maria and Mikhail's daughter. The birth of Olga, Nesterov's eldest and favourite daughter, was the source of great joy for the couple, but Maria developed com­plications after childbirth, and soon died. Shaken, Nesterov poured his grief into art: "That bitter-sweet feeling still upon me, I drew a lot back then, and the image of my deceased [wife] would not leave me; her features were everywhere, the peculiarities of her face and her ex­pressions came back to me and found their way into drawings and sketches. <...> It felt like she was with me then." Nesterov captured his late wife's image in a posthumous portrait (which he later de­stroyed) in her wedding attire, as well as in his painting "Bride of Christ". In the same way that the first meeting of the young couple was reflected in Nesterov's drawings, his last farewell to his dying wife was depicted in his watercolour "The Last Sunday. June 1 1886." "My love for Masha [nickname for Maria] and losing her made me an artist, brought substance into my art that had not been there before, gave it feeling and a living soul - in a word, everything that people came to value, and still value in my art," Nesterov wrote to describe the important role his wife played in his development as an artist. Unfortunately, very few of Maria's letters survive today; Olga, the eldest of Nesterov's children, gave some letters to the Tretyakov Gallery but requested that they not be published. Nesterov's letters to Olga are marked with special warmth; they give the reader a chance to appreciate his attitude towards her mother. One letter helps us clarify the date of Maria Martynovskaya's death. Many rese­archers have mistakenly stated the date, which is never clearly indi­cated in the artist's memoirs, as May 29. However, in his letter to Olga of June 1 1906 Nesterov wrote about marking the anniversary of her mother's death on that day. Another fact pointing to June 1 is the name the artist gave to the watercolour depicting his dying wife, "The Last Sunday. June 1 1886." Also, it was June 1, not May 29 that fell on a Sunday in 1886 - it was indeed on a Sunday, according to Nesterov's memoirs, that Maria died. Nesterov painted many portraits of his oldest daughter, who reminded him of his beloved late wife, the most famous of which is "Portrait of O.M. Nesterova" ("woman in a Riding Habit", or "Ama­zon"), executed in 1906; he painted it in between two dangerous ope­rations that Olga had to undergo, expressing his fear of losing her and his desire to preserve her features in his art. Nesterov's friend Sergei Durylin wrote to Olga about this portrait: "In the same way as 'the girl with peaches' (Vera Mamontova) is the best, the fairest Russian young woman of the 1880s, so is 'the girl in a riding habit' (you!) the best and fairest Russian young woman of the early 1990s. <...> How marvelously did he [Mikhail Nesterov] combine here his love for his daughter with his admiration for the young Russian woman." Quite justly, the artist considered this portrait among his best works, and viewers mainly know his daughter Olga from it. 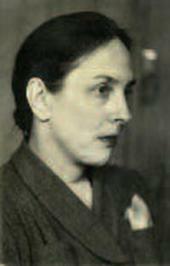 It is less known that Olga Nesterova continued her father's work and became an artist herself. An intriguing note from Nesterov to his very young daughter, written in block letters, is kept at the Tre­tyakov Gallery. The artist is asking her to have her photograph taken for a portrait and includes a rough sketch with a note that says "You can colour it"; indeed, the drawing is "finished" with coloured pencils. It seems it was with such "colouring" and "collaborative work" that little Olga started drawing. She did not receive any formal art educa­tion; however, from Lyolya Prakhova, a friend of the family who was briefly engaged to Nesterov, she learned to create silk embroidery using a special stitching technique of the 16th-century embroidery masters, and her works were indistinguishable from watercolour. 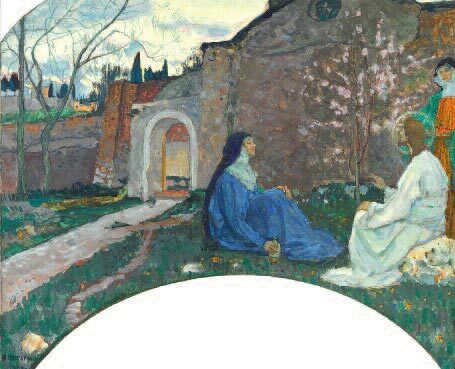 Mikhail Nesterov met Lyolya Prakhova after he moved to Kiev, where he was invited to take part in painting the interior of the Cat­hedral of St. Vladimir. It was there that he became close to the family of Adrian Prakhov, who was in charge of the work on the cathedral; Prakhov's daughter Elena (1871-1948), who was nicknamed Lyolya, be­came a dear friend. The artist found Lyolya to be talented, uncom­monly pure and kind, and chose her as his model for painting the image of St. Varvara in the cathedral. As a result, the small saint in the fresco had such a likeness to Lyolya that one of Kiev's grandes dames declared: "I cannot pray to Lyolya Prakhova! 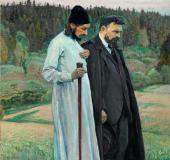 ", and Nesterov was required to re-paint the image, making changes to the saint's pose and face. 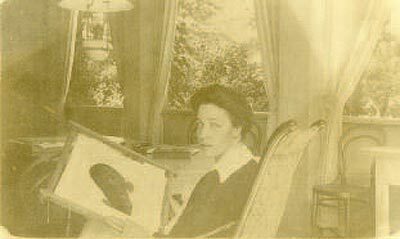 The artist was convinced that Lyolya Prakhova was someone who understood him very well: "That part of my soul, or my spirit that was the source of my art, the source of 'Bartholomew', 'Tsarevich Dmitry' and my other paintings, that corner of my very nature, my creative soul was not known to many - maybe two or three [people]. My late mother knew it, and Lyolya Prakhova guessed..." In 1899, "after ten years of friendship", Nesterov proposed to Lyolya, and was accepted; however, the engagement did not last, which did not pre­vent them from remaining lifelong friends. In one of the letters (inclu­ded here) Nesterov wrote to his daughter Olga fourteen years after he and Lyolya Prakhova broke their engagement, he remembers Lyo­lya not as a friend, but as someone who was once his muse. 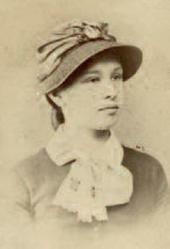 Nesterov's new love, and the mother of his middle daughter Vera , was Yulia Urusman (1877-1962), a teacher. 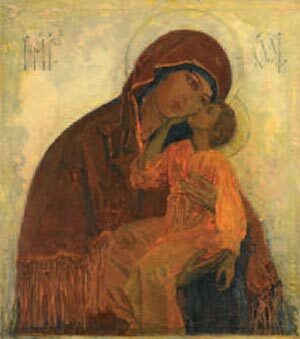 Her images in Neste­rov's art would later be referred to as "Nesterov's woman" - a refined and spiritual face, enormous sad eyes full of deep feeling... Yulia Urus-man's image became part of such works as "Thoughts", "Beyond the Volga", "Aksakov's Motherland", and "The Raising of Lazarus". Yulia also modeled for Nesterov's frescoes in the Marfo-Mariinsky Convent of Mercy; her features may be discerned in the frescoes Nesterov painted for the St. Alexander Nevsky Cathedral in Abastumani. In Nesterov's "Holy week", one of the female figures is that of a woman holding a small light-blue coffin (coffins of this colour were used to bury male babies who died in infancy) - this image also likely related to Yulia Urusman and Fedya, her son with Nesterov who died at birth in 1902. 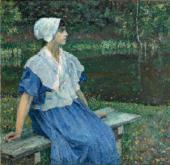 Nesterov also painted several portraits of his daughter with Urusman, Vera. 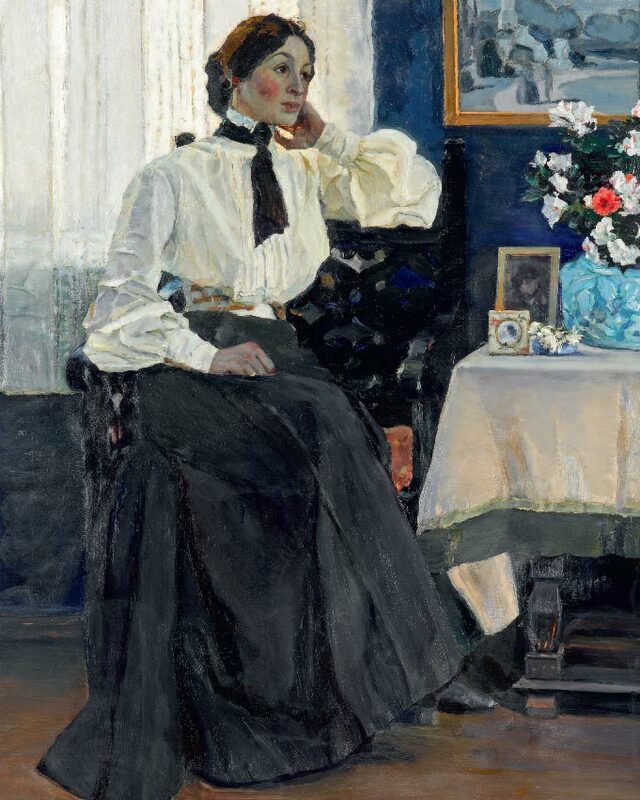 The artist complained to Vera that her features pro­ved "elusive" to him, that he was not entirely happy with his portraits of her; it was only his 1918 drawing of Vera that he praised: "...as good as Valentin Serov's." Even though Urusman and Nesterov remained friends all their lives, his letters to her are little known. 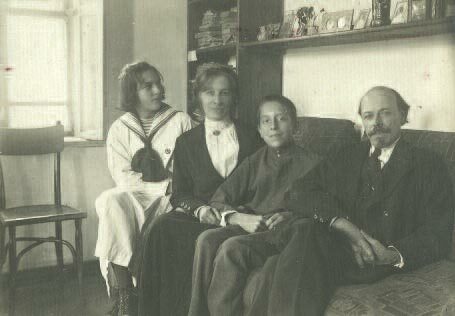 At the same time, much of his correspondence with his daughter Vera was preserved and can help us understand Nesterov's life in the 1920s and 1930s. The artist's granddaughter (Vera's daughter) Maria Titova published these letters in 2012. with Ms. Titova's permission, one of them is included here; in it, we see Nesterov not as an artist, but as a devoted, albeit strict fat­her and grandfather, a witty man with a way with words. In 1902 Nesterov married again - his bride, Yekaterina Vasilyeva (1879-1955), was a schoolmistress at the Kiev Finishing School, where Olga, Nesterov's eldest daughter, was studying. 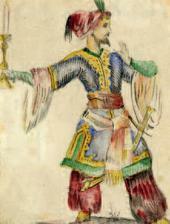 In a letter to Alexan­der Turygin, the artist described how they met: "About three weeks ago, I was told that a certain schoolmistress from the Institute (whom I did not know) was asking for permission to visit me and see my painting - young, beautiful, a favourite of the Countess Kono-vnitsyna , et cetera. I agreed... and now this young woman has fallen in love with me, passionately and with abandon, and I fell in love with her like a schoolboy. She is indeed beautiful, tall, elegant, very intelli­gent, and by all accounts, a wonderful, steadfast and selfless person." 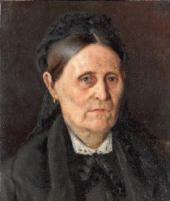 The artist's second wife remained his faithful companion for 40 years, until the end of his life. Nesterov valued her "unusual, heartfelt and intelligent interest in his art", her "love for everything he holds dear" ; in his correspondence, he often mentioned that Yekaterina took care of household work. "My wife is in the kitchen, cooking, roa­sting, darning all sorts of things - and I keep painting," he wrote to his friend Turygin. Yekaterina's portrait, which the artist painted in 1905 in their apartment in Kiev, was Nesterov's first portrait that he considered good enough to be exhibited. The sadness, sorrow and disappoint­ment, the discord with the world that filled his earlier female images, in this portrait gave way to peace of mind and harmony, to a quiet delight in the world. Later, the artist would paint many more portra­its of his wife and use her as a model for an icon and frescoes at the Marfo-Mariinsky Convent; thus, she served as the model for Mary listening to the words of Christ. 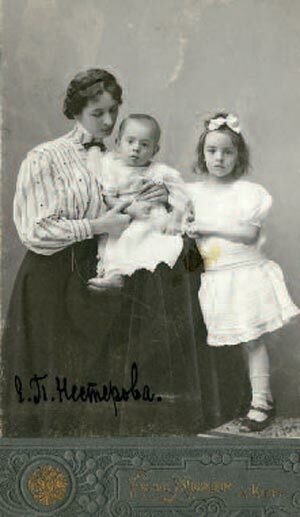 After a year of marriage Yekaterina gave birth first to a daugh­ter, Natalya (another daughter, Nastenka, was born in 1904 but died in infancy), and then their son, Alexei, in 1907. Nesterov would paint numerous portraits of his children with his second wife, and his son Alexei would also serve as the model for the young boy who sees Christ in "In the Land of Russia (The Soul of the People)". For a long time the artist was looking for the right image and the right pose, so when one day he noticed all that in his son, he hurried to take a pho­tograph (published here). Mikhail Nesterov's correspondence with his second wife and their children is housed at the Tretyakov Gallery. The artist's letters to his wife Yekaterina are "active", so to speak. Many of his letters to his oldest daughter may be called lyrical, while his letters to Turygin are philosophical; his letters to his second wife may be called "epic" as it is narrative that prevails in them. written when they happened to be apart, these letters contain detailed accounts of Nesterov's everyday life, of his social meetings and impressions; they prove that the artist's wife did not only help him run the household - he often asked for her assistance in his work. In one such letter, Nesterov outlined Yekateri-na's role in their life together: "you are the wheel in our mechanism (but I am still the mechanism!)". Nesterov's letters to Natalya and Alexei (Alyosha), his children with Yekaterina (in the Tretyakov Gallery Manuscripts Department), echo the impressions the viewer gets from their portraits. Natalya's letters are alive, vibrant and sharp, and that is how she comes across in the portrait "Young Girl by the Pond", painted by her father in 1923. In contrast, Alexei's letters are more measured and contemplative, very much like his image in his father's 1919 study "Portrait of Alyosha Nesterov". The artist was well aware of how different his children's personalities were - in a letter, he called Natalya "Master Natasha" and Alexei - "Miss Alyosha". As for the future lives of family members: Irina Shreter (1918-2003), the daughter of Olga Nesterova-Shre-ter, became a production designer; her work in the cinema included such films as "Girls", "The Garnet Bracelet", "Master of the Taiga", "At Home Amongst Strangers, a Stranger Amongst Friends", and others. 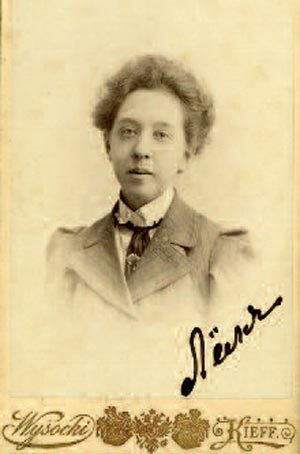 Nesterov's other granddaughters, the children of his middle da­ughter Vera Nesterova-Titova, became successful scientists. Tatiana Titova (1939-2010), the younger of the two, earned a graduate degree in physics and mathematics and worked at the Institute of Physical Chemistry. The older one, Maria Titova (born 1937) is a Professor of Me­dicine at the Vishnevsky Institute of Surgery. Maria fulfilled her grand­father's desire that one of his relatives became a medical doctor; to this day she remains the guardian of her grandfather's legacy. As fate would have it, the second husband of Nesterov's daugh­ter Natalya (1903-2004) was Fyodor Bulgakov (1902-1991) , the son of the Russian philosopher Sergei Bulgakov, one of the subjects of Ne­sterov's painting "The Philosophers". 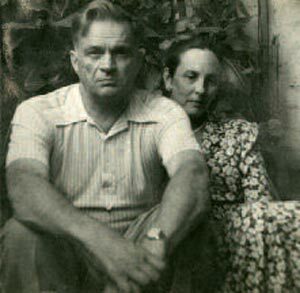 Alexei (1907-1942), Nesterov's son with his second wife, was a professional horse breeder, an amateur artist and photographer; he also wrote poetry, and one of his poems is included here. 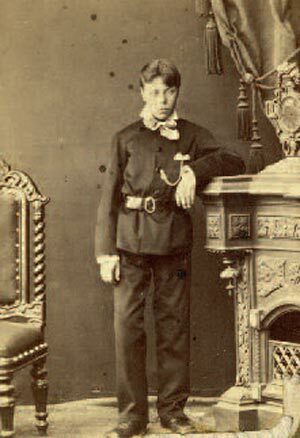 Alexei died the same year as his father after a long battle with tuberculosis. Mikhail Nesterov himself remained in good spirits and continued painting until the end of his life. He was 80 when he died on October 18 1942 in the arms of his wife Yekaterina, who, along with his children and grandchildren, did so much to preserve the artist's legacy. <...> Needless to mention, I will remember this trip well; I have seen a lot of things that would be hard to forget. I believe that it will not fail to influence my advancement as an artist, even if I am unable to paint anything, because I have seen so much, and there is still so much to see; so when I come back to Russia and study hard, it is my hope that the flaws that are so big now will gradually disappear. Tretyakov Gallery Manuscripts Department, F. 100, item 1279, pp. 1-2. MIKHAIL NESTEROV'S LETTER TO VASILY, MARIA AND ALEXANDRA NESTEROV, WITH HIS DRAWING COLOURED BY HIS DAUGHTER OLGA. MIKHAIL NESTEROV’S LETTER TO VASILY, MARIA AND ALEXANDRA NESTEROV, WITH HIS DRAWING PAINTED BY HIS DAUGHTER OLGA. MIKHAIL NESTEROV’S LETTER TO HIS SISTER ALEXANDRA NESTEROVA, WITH HIS DRAWING COLOURED BY HIS DAUGHTER OLGA. How are you, my dear Olyushka! I was expecting that you would send me a message today, while still on the road, but instead I got your telegram from Ufa. Thank you for remembering, and for your congratulations. I did indeed turn 44 today, and in a few days you will be 20! A lot has happened through the years, some good, some not so good... one cannot live without that... I cannot be like "Demon" and say that I "do not miss the past" - I do miss it, I miss it a lot! One cannot bring it back - and it is hard to amend... Especially when one starts fe­eling that old age is approaching. How is your embroidery coming along? I will not give up hope of receiving a gift from you one day, and I will do so with great plea­sure. MIKHAIL NESTEROV’S LETTER TO VASILY, MARIA AND ALEXANDRA NESTEROV, WITH HIS DRAWING COLOURED BY HIS DAUGHTER OLGA. MIKHAIL NESTEROV’S LETTER TO OLGA NESTEROVA WITH HIS DRAWING COLOURED BY HIS DAUGHTER. Noon today was 20 years since your mother passed away. I just came back from the Danilov monastery, where we atten­ded the memorial service, tidied up the gravesite, cleaned the monu­ment; and I saw in front of my eyes, like it was happening now, those terrible days of 1886, impossible to forget. Oh! How excruciating, how hard it was... <...> And, both you and I were equally helpless then. Did you pray for your mother today? I went to Petrovsky Park yesterday, walked by the church where we were married; then I walked by the house in Zykov Pereulok, where the poor folk used to live, and still live, and where your mother and I lived before the wedding. The little house is still standing, as is the attic with the single window where I lived. It all has passed, all gone! I have "grown up", have become "a famous artist", but am I happy? Do not "overthink" it, as I always did, and always regretted later. Tretyakov Gallery Manuscripts Department, F. 100, item 1453, pp. 1 (reverse)-2. How are you, my sweet "oldest granddaughter"? Tretyakov Gallery Manuscripts Department, F. 100, item 1470, p. 1. I gave your letter to Vera. She <...> is so good-natured, so caring towards everyone, a sweetheart. <...> Kisses from your loving father. Tretyakov Gallery Manuscripts Department, F. 100, item 1464, pp. 1-1 (reverse). My love and kisses to my granddaughters, whether obedient or not, and to you. From the archives of Maria Titova. Tretyakov Gallery Manuscripts Department, F. 100, item 1834, pp. 1-1 (reverse). A DRAWING MADE BY OLGA NESTEROVA ON AN UNFINISHED LETTER [TO HER AUNT, ALEXANDRA NESTEROVA]. 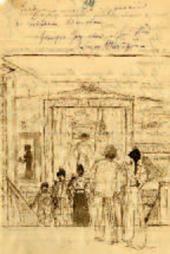 A DRAWING MADE BY MIKHAIL NESTEROV IN CHILDHOOD. IN THE LAND OF RUSSIA (THE SOUL OF THE PEOPLE). ALEXEI NESTEROV POSES FOR THE COMPOSITION “IN THE LAND OF RUSSIA”. 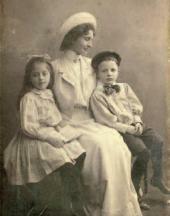 YEKATERINA NESTEROVA WITH HER CHILDREN, NATALYA AND ALEXEI. YEKATERINA NESTEROVA AND NATALYA NESTEROVA POSING FOR IMAGES DESTINED FOR THE ICONOSTASIS AT THE MARFO-MARIINSKY CONVENT. ARTIST’S COPY OF A MURAL ON THE NORTHERN WALL OF THE CHURCH OF INTERCESSION AT THE MARFO-MARIINSKY CONVENT IN MOSCOW. 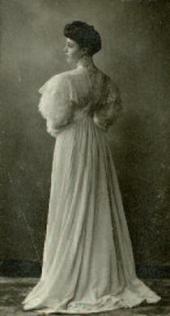 OLGA NESTEROVA IN A DRESS MADE FOR THE GRADUATION CEREMONY AT THE INSTITUTE FOR NOBLE YOUNG LADIES IN KIEV. 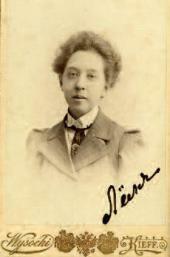 VERA NESTEROVA, THE ARTIST’S MIDDLE DAUGHTER. MIKHAIL NESTEROV WITH HIS SECOND WIFE, YEKATERINA, AND THEIR CHILDREN, NATALYA AND ALEXEI. 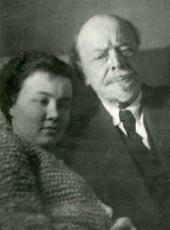 MIKHAIL NESTEROV AND IRINA SHRETER. YOUNG GIRL BY THE POND (PORTRAIT OF NATALYA NESTEROVA). MIKHAIL NESTEROV’S LETTER TO HIS FAMILY. “YESTERDAY MY PAINTING WAS FINALLY MOUNTED [REFERENCE TO NESTEROV’S COMPOSITION “THE YOUTH OF ST. SERGIUS OF RADONEZH”], FLANKED ON THE WALL BY AP[OLLINARY] VASNETSOV’S LANDSCAPE (A LAKE) TO THE RIGHT AND GHE’S PORTRAIT OF MARIA TOLSTAYA TO THE LEFT (MIRRORWISE) <…> AT THE END OF THE LETTER I ATTACH A DRAWING FEATURING MY COMPOSITION AND OTHER NEIGHBOURING ONES AS VIEWED BY SPECTATORS FROM THE STAIRS”. 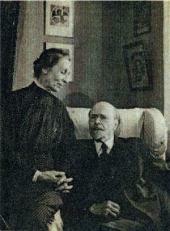 NATALYA NESTEROVA AND FYODOR BULGAKOV. YEKATERINA AND MIKHAIL NESTEROV IN THEIR APARTMENT ON SIVTSEV VRAZHEK STREET.